Turn right into parking lot at trailhead, per signage for "Lake Twentytwo"
The trail generally zigzags along Twentytwo Creek, which tumbles down a series of falls officially known as Twentytwo Creek Falls, although several individual plunges have unofficial designations. The first and smallest of the falls encountered along the trail, shown here, is known as “Humpback Falls.” Boot paths lead to views of several of the falls, but care should be exercised when exploring off the main trail, as the side trails are rugged and often end at brinks of ledges obscured by foliage. Lake Twentytwo Trail, May 09, 2015. 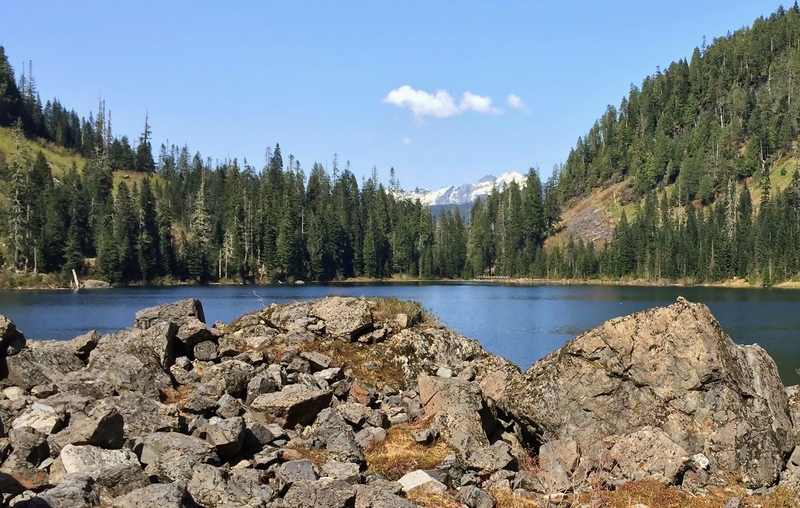 Unlike much of the surrounding wilderness, Lake Twentytwo and the virgin forest that cloaks its watershed remain untouched by logging or fire and have been protected as a research natural area since 1947. The trail up to and around the lake climbs moderately through subtly varying ecological layers, ranging from plush mosses to stony barrens and accented throughout by massive conifer columns. Water is a consistent feature. Rivulets frequently cross the trail, often co-opting it for short distances before slipping elsewhere out of sight. Glimpses of the South Fork Stillaguamish River appear through the forest fringe before the trail turns upward, never meandering far from Twentytwo Creek’s many boisterous waterfalls, collectively known as Twentytwo Creek Falls. At the foot of Mount Pilchuck‘s sheer northern face, the trail loops around the lakeshore, continuing through distinctly varying habitats including bogland, boulderfields, and subalpine forest. Lake Twentytwo’s unusual name is thought to have derived from numeric designations on early surveyor’s maps before English names had been assigned to the local water bodies, with this particular lake and creek never receiving any other moniker. The lake’s now official designation flouts standard English punctuation, with several other iterations also in common use, including Lake Twenty-two, Lake Twenty Two, and Lake 22. The names for its creek and falls follow suit. Although wet and rocky in places, the trail is heavily used. Be prepared with appropriate footwear and, especially on weekends, expect the company of fellow hikers. Twentytwo Creek gurgles down a series of sun-dappled pools. Lake Twentytwo Trail, May 03, 2015. The stars of the old-growth forest along the trail are its venerable western redcedars (Thuja plicata), some reaching upwards of twelve feet/3.70 meters in diameter. Actually a species of cypress, redcedars are misnamed “cedars” for their similarly aromatic and rot-resistant wood. Lake Twentytwo Trail, May 03, 2015. Mimicking the conifers towering above, tiny groves of moss thrive in the well-watered lower elevations. Lake Twentytwo Trail, May 03, 2015. Oblivious to human intrusion onto their ancient paths, streams patter across the trail at will. Lake Twentytwo Trail, May 03, 2015. 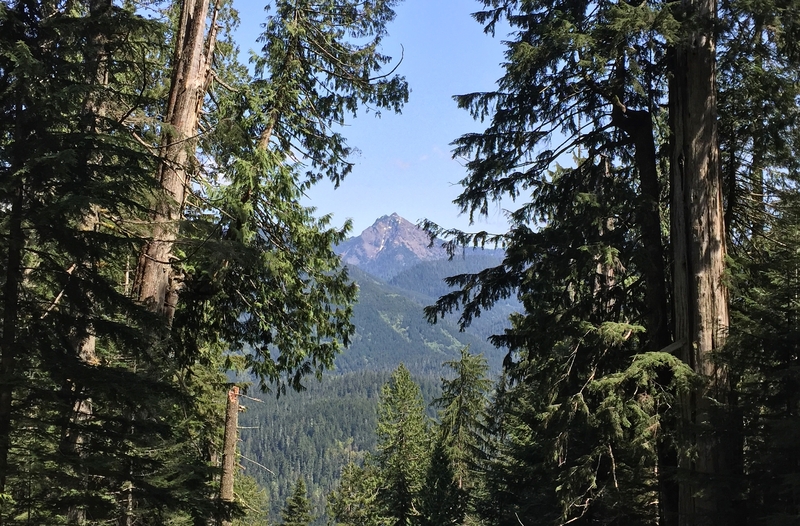 An open talus slope, too rocky to support large trees, interrupts the forest mid-way up the trail, affording northeasterly views of the Cascades, most prominently Liberty Mountain (here, the treeless peak beneath a tiny cloud). Lake Twentytwo Trail, May 03, 2015. A variety of wildflowers dots the trailside throughout. In the top left, a salmonberry (Rubus spectabilis) blossom gazes out beside a newborn berry. On the right, a Pacific bleeding heart (Dicentra formosa) lofts its dangling, namesake charms. In the center left, a violet (likely a pioneer, smooth yellow, or stream violet, Viola glabella), fond of moist shade, squints into sunlight on the forest’s verge. Uncommon on the west side of the Cascades, anemones in the center right (likely western wood, or, Lyall’s anemones, Anemone lyallii) nevertheless make an appearance along the open talus slope. Pacific trilliums (Trillium ovatum), bottom left, bear a resemblance to their domestic garden lily cousins. In the bottom center, a plumed Solomon’s seal (Maianthemum racemosum) nods from out the trailside shadows. Lake Twentytwo Trail, May 03 and 09, 2015. A watchful eye to the wayside rewards with glimpses of Lilliputian curiosities. 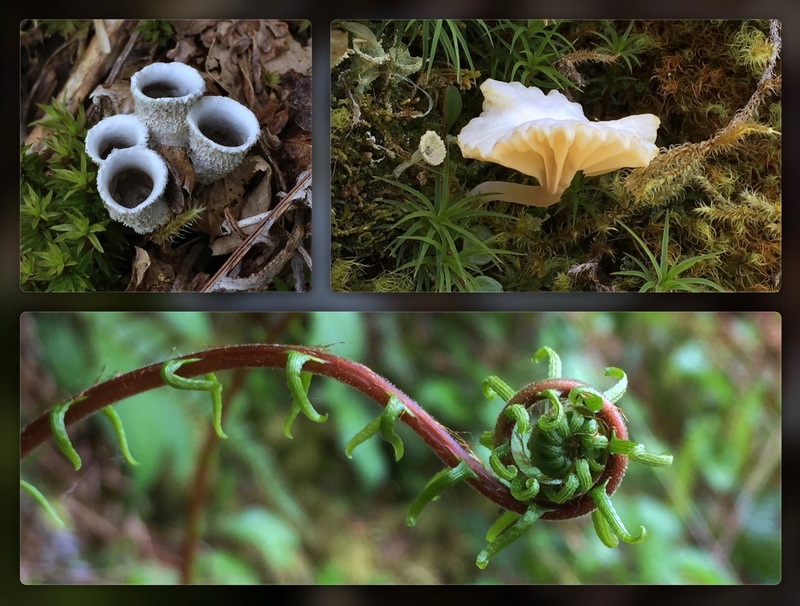 The pallid cups on the top left are bird’s nest fungi (Nidulariaceae) and would once have held clutches of spore-bearing “eggs” that were dispersed by raindrops. On the top right, a stumpside mushroom unfurls its luminous cap amid a bed of mosses and lichens reminiscent of an undersea garden. On the bottom, the dragon-like fiddlehead of a deer fern (Blechnum spicant) slowly spirals forth into a frond. Lake Twentytwo Trail, May 09, 2015. A grove of bigleaf maples (Acer macrophyllum) enjoys the unobstructed sunlight at the edge of the talus slope. Lake Twentytwo Trail, May 09, 2015. Beyond the talus slope, the old forest encloses the trail again, here framing the view of Liberty Mountain. Lake Twentytwo Trail, May 03, 2015. A short distance from the lake, its waters cascade in strands down a rocky staircase unofficially known as “Apron Falls.” Lake Twentytwo Trail, May 03, 2015. Lake Twentytwo pools at the foot of Mount Pilchuck‘s great northern wall, whence the mountain’s summit sweeps upward far beyond sight. May 09, 2015. 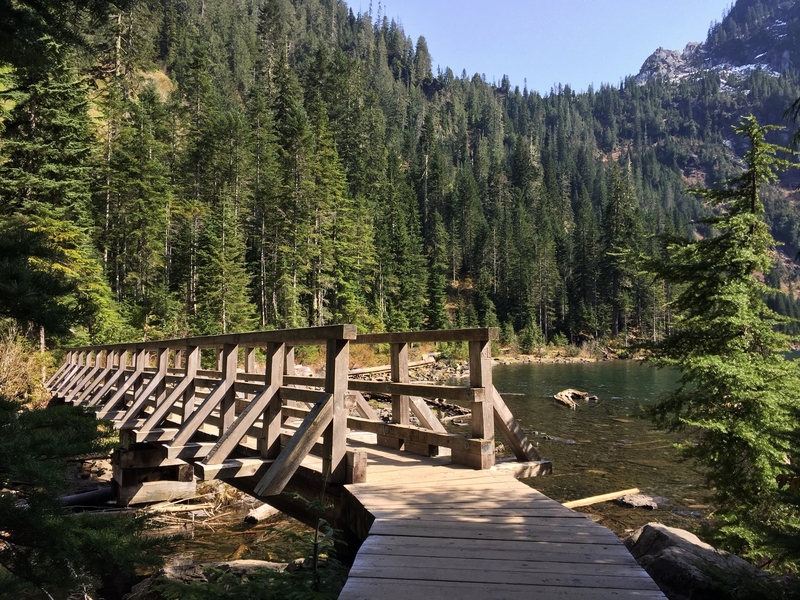 A substantial trestle bridge bears the trail across Lake Twentytwo’s outlet to Twentytwo Creek and delivers it to a boardwalk that rounds the lake’s boggy eastern edge. May 03, 2015. Clear, stony voices of the many rills clattering down Mount Pilchuck‘s massive face ring across the lake. Lake Twentytwo, May 03, 2015. Lake Twentytwo laps the base of Mount Pilchuck‘s abrupt massif, where waterfalls coursing down its rugged stone disappear into the scree that skirts its feet. May 09, 2015. Three Fingers’ snow-clad peak peers above the horizon’s cleft at the lake’s outlet to Twentytwo Creek. Lake Twentytwo, May 03, 2015. 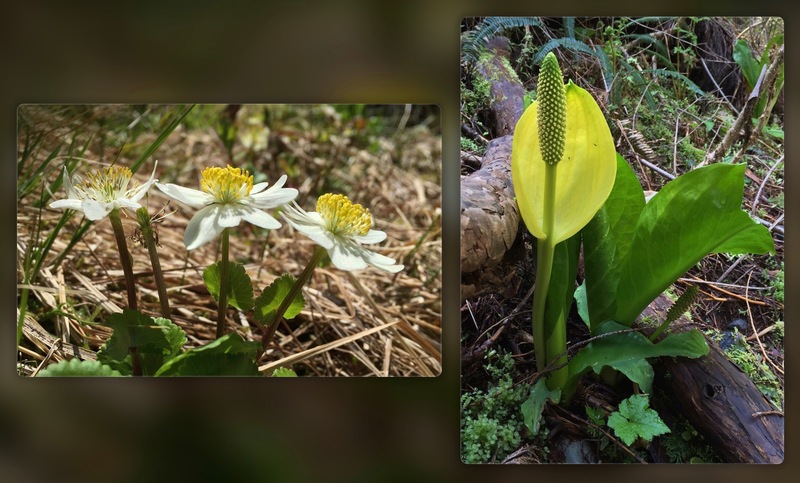 In the upland bogs near the lake, look for white marsh marigolds (Caltha leptosepala) and the exotic-looking, yet foul-smelling skunk cabbage or, swamp lantern (Lysichiton americanus). Lake Twentytwo Trail, May 03, 2015. From the shadow of Mount Pilchuck‘s eaves, Lake Twentytwo sprawls across its glacier-hewn cirque. Lake Twentytwo Trail, May 03, 2015.